The intent of this column is to inform the reader of hunting-related products which may have recently come on the market, or have been in smaller regional distribution and overlooked by hunters away from those areas. It is our goal to save our readership the outlay of time and money required to personally test these products. The column will be based on actual field testing. Our desire is to "sweat" the undependable, misadvertised, or ineffective product out of consideration, and save our readers from possibly wasting their hard-earned hunting time and money. We will only recommend gear that passes our tests and we believe would be of value to our readers. Bowhunters: String slap is the nasty by-product of the sport that leaves no doubt in your mind that your pain sensors are still active. And when you throw the bulk of a hunting jacket into the calculation, it can add up to thrown arrows and missed animals. Neither prospect is very appealing. For hundreds of years the strap-on arm guard has been the standard protection from this unwanted sensation. You either tied or snapped the guard on and eventually you swore at it  either from the annoying chaffing of your skin or the broken straps which were inevitable. Buckwing Products Saveyur II Arm Guard solves all these problems. Their expandable material arm guard has two plastic stays sewn in to keep the string from biting. And there is enough durable flex in the stretch material to fit snugly on a bare arm or to hold the most bulky coat sleeve out of the string path, and then return to a comfortable fit on the bare arm again. The material on the 8-inch arm guard is tough and has stood up excellently to the brutal string slap from my hyper-fast/short-braced hunting bow. The guard slips quickly and firmly into place and stays there. And it breathes, so no sweaty arms during the early part of the season. Reach Buckwing at www.buckwing.com. Gun hunters: Have you ever bent over and had your slung rifle go crashing muzzle first into the ground? How about that tired, sore shoulder barking at you at the end of a long day of toting around your rifle in a sling. Gunslinger Corral Rifle holster is the sure cure for these pains. The easily adjustable rifle belt holster hooks around the stock of your rifle at the pistol grip (does not fit lever action rifles) and not only supports the weight of the weapon, it holds it securely in place on your shoulder, leaving both hands free. Bending and crawling through brush is no longer a problem. Your rifle stays in place and wont unexpectedly go sliding over your head and into the rocks. One quick snap of the retaining strap and the rifle is instantly ready for use! The Rifle holster comes with a 2-inch nylon belt and quick-release buckle. The belt is long enough for any girth imaginable. The hunter can cut the excess belt easily and neatly to fit his waist, or the holster can also be used on any belt up to 2-inch width. 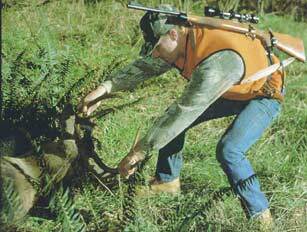 A universal backpack attachment for use by hunters who tramp the woods with a daypack on their backs is also offered. For hunters or fishermen who find themselves spending a little time on a stream where large bears are a real problem, the Compact Rifle Holster is the ticket. It will hold a rifle or large bore shotgun in place comfortably, in the center of your back, and allow a full day of comfortable fly fishing with instant protection available at all times. This is a winner product! For information, telephone New Frontier Products at 888-900-8678. Hunters Afield: Scent companies appear to be the fastest growing segment of the outdoor retail market. New names and faces are popping up monthly. And if they decide to put the bulk of their financing into advertising instead of research, the hunter may end up with a very fancy smell that doesnt work! But, Bucks-n-Does HSE is a scent company that has been there for years, and has quietly researched and produced a full line of attractant and scent killer products to the peak of perfection. This East Coast company broke ground on the "full package" program for hunters years ago and finally is coming to the western hunter. Bucks-n-Does Ultimate Advantage Bear Hunters Program was thoroughly tested during the spring bear season; and the only word to describe it is, BooYa! What a package! The centerpiece of this particular package program (elk program is now under test) is the Bear Nip and Spring Bear-sow in heat scents. If the human body didnt have the overpowering odor that hunters constantly fight, we could stop writing right here. These two bottles had the power to lead a bears nose to the hunter, and keep him there! Very unique, and effective. However, Bucks-n-Does HSE knows that the entire picture has to be covered for consistent success. And although you can purchase scents separately, their specific program packaging was developed to cover the entire scent issue in one package. 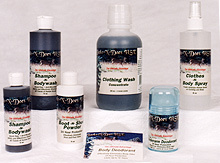 Clothing wash, shampoo-n-body wash, body deodorant spray, deodorant ball, clothing cover scent (specific scent available for every terrain type) and their unbelievably effective food scent  White Oak Acorn with Lichen, Moss and Clover  comes in addition to the Bear nip and Spring bear. Its a "no more thoughts needed" package. One of the unique advantages in using this product is the understated strength of the scent. Each product tested provided a "natural" level of scent as one would smell in the wild. These were easy traveling scents, without that animal-spooking, overpowering perfume strength, which so many products have. This is a very natural, well thought out and effective line, which produces the results as promised. The West will never be the same! Contact Bucks-n-Does HSE at www.bucksndoes.com or telephone 1-800-782-6686. These products tested well. We believe that WesternHunter.com readers will find them a good buy.